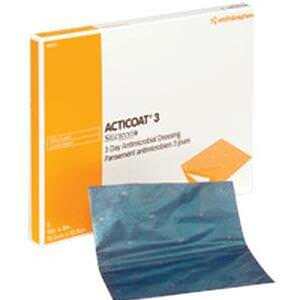 Smith & Nephew Acticoat™ Burn Dressing with Nanocrystalline Silver is an extended use silver antimicrobial barrier dressing which remains effective for up to seven days. The silver coating rapidly kills a broad spectrum of bacteria in as little as 30 minutes and protects the wound site from bacterial contamination while the inner core helps maintain the moist environment that can facilitate wound healing. Easier and less painful to remove, making it a dressing of choice. Not compatible with oil-based products, such as petrolatum. Can be used on extensive body surface area wounds. Sustained release of silver for 3 days.